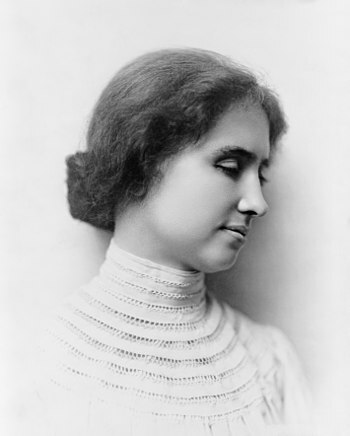 In honor of Helen Keller, an American author, political activist, and lecturer, who was born on this day in 1880. She was the first deaf and blind person to earn a bachelor of arts degree. Helen Keller was an inspirational figure in my childhood and I think it is sad that she has faded from view somewhat these days. Thank you for the reminder of this great lady and her wonderful teacher and companion, Anne Sullivan. Where knowledge, wisdom, and understanding all converge. Of despair, but you infuse strength in those who have no might. We must finish the work before life’s final tide shall surge. Search our hearts, O Lord, that you might purify and purge. As we continue to walk by faith and not by sight. I was always proud as a child to share a birthday with this wonderful, wise woman. Her story and love for God inspired me so much as a child. Thank you for sharing. This is too rich not to share. Enjoy and rejoice in a God such as ours who teaches us to overcome. He gives us joy, purpose, and so much more when we give Him our lives. No wonder we’re a thankful people!